Saint Sabbas (Sava), the first Archbishop and teacher of the Serbs, and the most beloved of all the Saints of Serbia, was born in 1169, and was named Rastko by his parents. He was the son of Stephen Nemanja, the ruler of Serbia, who is better known as Saint Symeon the Myrrh-streamer (see Feb. 13). As a young man, Rastko fled secretly to the Holy Mountain, Athos, to the Monastery of Saint Panteleimon. When his father learned of his flight, he sent soldiers after him. Before they could seize him, he was tonsured a monk with the name of Sabbas, after Saint Sabbas the Sanctified (celebrated Dec. 5). Soon after, he entered the Monastery of Vatopedi, where his father joined him in 1197. Together they rebuilt the Monastery of Hilandar and made it a great spiritual center for their countrymen. In 1200 Saint Symeon reposed, and his body became a source of holy myrrh; in 1204 Saint Sabbas was compelled to return to Serbia with his father's relics, that he might restore peace between his two brothers, who were struggling over the rule of the kingdom. The grace of Saint Symeon's relics, and the mediations of Saint Sabbas, healed the division between his brethren. After persuading the Emperor in Constantinople and the Ecumenical Patriarch to grant autocephaly to the Serbian Church, the Saint against his will was ordained first Archbishop of his native land in 1219, where he labored diligently to establish the Orthodox Faith. In 1221 he crowned his brother Stephen first King of Serbia (the memory of Saint Stephen, First Crowned King of Serbia, is kept on September 24). In 1234, foreseeing by divine grace his coming departure to the Lord, he resigned the archiepiscopal throne, named his disciple Arsenius as his successor, and made a pilgrimage to Jerusalem and Mount Sinai; while returning through Bulgaria, he fell asleep in peace in 1236. Because he has been ever since the national hero of Serbia and an invincible bulwark strengthening the Orthodox Faith, the Moslem Turks burned his incorrupt relics in the year 1594. See also June 28. The Church of thy people glorifieth thee as her first great prelate and a companion of the Apostles, O Saint. But since thou hast boldness with Christ God, by thy prayers save us from all harm that we may cry to thee: Rejoice, O divinely-wise Father Sabbas. 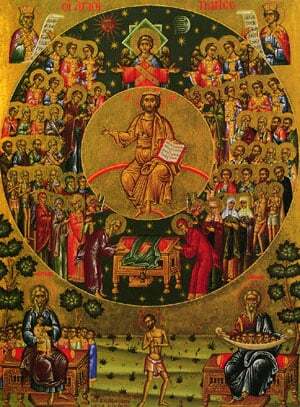 Share the feast of Sabbas (Sava), Archbishop of Serbia with an icon greeting ecard.